External parasites are always concerning when it comes to our pets. Fleas and ticks are two of the most common. Here’s what you need to know about them. Fleas are small, parasitic insects that feed by sucking blood from mammals and birds. While immature fleas do not bite, adult fleas usually feed several times a day. In most parts of Canada, the peak flea season is early August to early October. Ticks are parasitic organisms that attach themselves to the skin of dogs, cats, and other mammals by using their mouthparts. These parasites feed on the blood of their hosts and can cause toxicosis or hypersensitivity, and in some cases blood loss anemia. Ticks can also be transmitters of bacterial or viral diseases. The skin, the lymphatic and immune systems, and the nervous systems, can be negatively affected if gone untreated. Ticks come in 4 stages: egg, larvae, nymph, and adult. How can you tell if your pet has fleas and/or ticks? Unlike some parasites, both ticks and fleas are visible to the naked eye. You may or may not see your pet scratching if they have fleas. You will likely see either fleas and/or flea dirt (little black flecks that look like pepper). Ticks are larger than fleas and grow as they feed on your pet, changing colour at the same time from a dark brown to greyish. Ticks often look like small skin tags as the tick embeds its head under your pet’s skin and only its body is visible. Ticks should be removed using a specially designed, inexpensive tick remover (e.g. Tick Twister) to ensure all of the head and mouthparts are removed. How do you prevent fleas & ticks in pets? There are many safe and effective products available at our veterinary clinic to prevent flea infestations and tick attachment. Some products are topical (applied on your pet’s skin) while others are given by mouth. The frequency of administration depends on the product you choose. What should I do if I find fleas on my pet(s)? The best defence is a good offense! It is much easier to prevent fleas than to treat them. If your pet lives what is considered a “high risk” lifestyle (indoor/outdoor pets, doggy-daycare goers, etc), it is much easier to keep them on prevention year round. Adult fleas live for about 100 days, in that time they feed off of our pet’s blood and produce eggs. These eggs then hatch in the environment (our homes, as well as outdoors). This is where they complete their transition from larvae to pupa to adult flea. Pupae can survive in a dormant state for almost 200 days, which is where getting rid of an infestation can become an issue. If you have an active flea infestation, you must treat for 3 months minimum, in order to catch every life stage of the flea. The other trick to getting rid of fleas is that EVERY cat, dog, and ferret, in the house, must be on prevention/treatment. Even if your dog has fleas and your indoor-only cat does not, yet, they will both need to be treated. Treatment is strongly recommended because of the discomfort they cause, the role they play in contracting tapeworms by being injected and because they can cause zoonotic diseases such as bartonellosis or cat scratch fever. Due to the life cycle of the flea once fleas enter your home it usually takes 90 days to complete the treatment to get rid of them. What are the treatment options for ticks? There are a few products to choose from, the protection you use to guard your pet(s) against tick attachment and subsequent transmission of tick-borne diseases comes down most often to your preference as some products require monthly application/administration while others are designed to last three months per dose. Would you pay for subpar oral care? 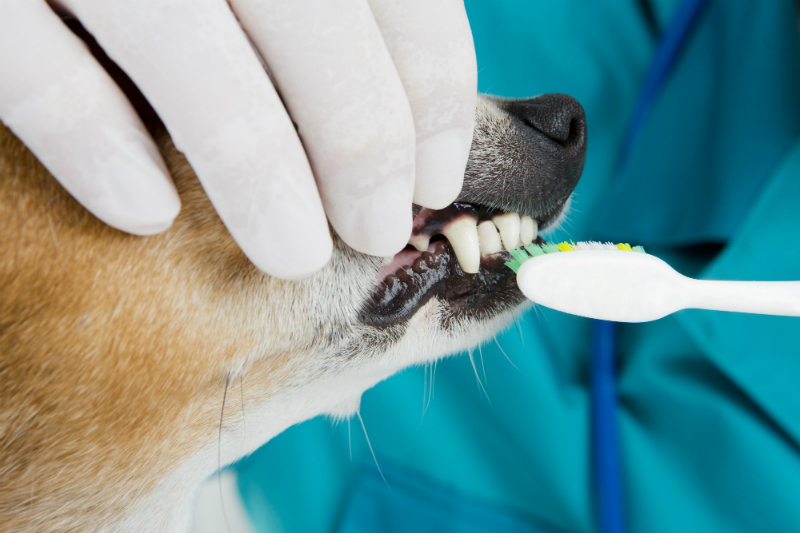 We do a full anesthetic dental cleaning nearly every day at the clinic.